What does it cost to remove wisdom teeth? At Wellington dentists the cost will be $180-$450 for one wisdom tooth (depending on complexity), for two wisdom teeth it would be between $320-$1000 for three between $470-$1200 and four between $600-$1600. IV Sedation costs $375 (Go to sleep while getting dentistry). Your dentist can help you evaluate the specific conditions of your wisdom teeth and the role they play on your total oral health. Although many individuals may benefit from the removal of their wisdom teeth, others may not derive significant benefits and removal may not be recommended. There are many conditions associated with wisdom teeth that would be an indication for their removal. In the discussion that follows several of the more common indications for removal of wisdom teeth will be presented. As a general rule patients will benefit from the early removal of “high risk” wisdom teeth, rather than waiting until the teeth become symptomatic or cause damage to adjacent teeth.The first condition that is evaluated when examining wisdom teeth is whether they will fully erupt into the dental arch or whether they will become impacted. Teeth that have some factor that is preventing their normal eruption are termed “impacted”. Ninety-five percent of wisdom teeth that erupt will have completed their eruption by the age of 24. Wisdom teeth that are impacted have been shown in multiple studies to be associated with a higher risk of becoming symptomatic (causing pain) and other pathologic conditions such as infection, the development of cysts, and even tumours. However, all impacted teeth do not necessarily need to be removed. This is optional, but effectively it means you are put to sleep so that you are not aware of the process. It is not a general anesthetic like at a hospital but for patients the effect is similar but without all the side effects that general anesthesia has. Ask us about this when you come in, we can explain it in great detail. Approximately 25-30% of impacted mandibular wisdom teeth are removed due to a condition known as pericoronitis. Pericoronitis is a localized infection of the gingival tissues (gums) associated with a partially erupted wisdom tooth and usually causes significant discomfort. The illustration at right demonstrates this inflamed gum tissue overlying the wisdom tooth. In certain situations this localized infection may spread and result in a more serious and even life-threatening cellulitis. Treatment of pericoronitis usually involves the removal of both the upper and lower wisdom teeth. The upper wisdom tooth is removed because it impinges on the swollen gun tissue around the lower wisdom tooth. Another common reason for removal of wisdom teeth is that they may become impacted against the second molar (the tooth in front of the wisdom tooth), causing decay or resorption on the root surface of the second molar. Due to the difficult if not impossible task of properly brushing and flossing around a partially erupted wisdom tooth, they frequently will develop dental decay (caries) or periodontal disease. One of the most controversial issues regarding mandibular third molars is the role they play in the crowding of the lower front teeth, especially after orthodontic treatment. Multiple studies have been reported that support both sides of this issue. The conclusions of these studies vary from wisdom teeth having little or no effect on crowding, to wisdom teeth as the single most important factor in crowding of lower front teeth. Again this evaluation is one that should be done on an individual basis with consultation from a dentist, orthodontist, or oral and maxillofacial surgeon. Approximately 1-2% of wisdom teeth are removed because of pathological conditions such as cysts or tumors. Although 1-2% sounds like a very low probability of a given individual experiencing one of these conditions, in a metropolitan area of one million people between 10,000 – 20,000 people will have some type of pathological condition associated with their wisdom teeth. As oral and maxillofacial surgeons, we see patients with a variety of pathological conditions associated with their wisdom teeth on a routine basis. Most of these conditions can be detected during routine dental exams and by a panoramic radiograph (x-ray). Other common reasons for wisdom tooth removal are malpositioning of the tooth and decay or caries. Your dentist will usually recommend removal of the teeth rather than the time and expense of restoring them. The final decision of whether or not to have your wisdom tooth removed can only be determined after evaluating both the risks and benefits of this treatment. Therefore the remainder of this discussion will present some of the risks involved in the removal of wisdom teeth. Again the condition of an individual patient’s wisdom teeth and the degree of surgery required for their removal can vary greatly from one person to the next. The probabilities of risks presented in this discussion have been reported for a general population, the risk of such complications may be higher or lower for a given individual. The procedure itself will vary depending on the unique presentation of each patient. In some cases the teeth can be removed simply by applying traditional tooth extraction techniques. More commonly, the teeth are sectioned or separated into smaller pieces of tooth which can be removed one at a time. The advantages of this technique are that since bone removal is minimized, patients generally will heal more rapidly and will have less discomfort following the surgery. Due to the proximity of the lower wisdom teeth to the various nerves in the lower jaw, the removal of lower wisdom teeth has been associated with a 1-3% incidence of temporary numbness to the lower lips, gums, teeth, or tongue. The majority of temporary numbness occurs in the lower lip and may last 4-6 weeks. A very small percentage of these patients may experience a permanent sensory deficit to one of these areas. In the exquisitely rare cases of permanent changes in sensation, it should be noted that patients do not look different, drool, or talk differently. Of the areas at risk, the tongue can be the most bothersome to the patient, potentially affecting taste as well. If a patient experiences a numbing of the tongue without improvement after 4-6 weeks, then consideration may be given to exploration and repair of the nerve. Although post-operative infections after the removal of wisdom teeth are rare, any infection left without treatment can become severe. As stated above, one of the reasons people have their wisdom teeth removed is because they become infected. 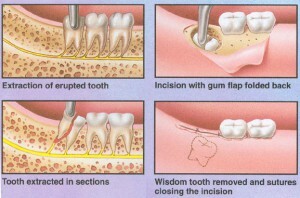 Therefore, some patients will already have an infection associated with their wisdom teeth at the time of surgery. Even after removal of the wisdom teeth these patients may require further treatment to resolve their infection. Rarely, patients may develop a chronic low grade infection of the bone at the extraction site, even weeks after the tooth was removed. This chronic infection of the bone (osteomyelitis) may require further antibiotic therapy and/or surgical debridement. The incidence for “dry socket” (alveolar osteitis) has been reported between 3-25%, with most reports around 5-10%. Dry socket is caused by an early breakdown of the blood clot that has formed in the bony extraction site, thereby exposing the bony socket. The symptoms typically occur 2-5 days after removal of lower wisdom teeth. The symptoms consist of increased pain at the extraction site, which may not be improved after taking analgesic medications (pain pills). The treatment of dry socket consists of placing a medicated packing into the socket site. This usually provides significant relief of symptoms within an hour. The packing is removed in 5-7 days. The occurrence of dry socket will not affect the final quality of healing and is more a nuisance than a true complication. Several factors have been associated with a higher risk of developing dry socket. Patients that smoke and women taking oral contraceptives seem to experience a higher incidence of dry sockets. Other complications associated with the removal of wisdom teeth include: damage to adjacent teeth, displacement of upper wisdom teeth into the maxillary sinuses, thermal sensitivity to adjacent teeth, pain or dysfunction of the jaw joint (TMJ) and limited opening. Sinus complications including infection or openings with communication with the mouth occur rarely and may require occasional treatment or surgery. After removal of wisdom teeth the patient should expect to experience certain normal post-operative symptoms. These include mild to moderate bleeding which should decrease over the first few hours, but mild “oozing” from the extraction sites may continue for up to 2 days. Also patients will experience some swelling, especially in the lower jaw, which may increase for 2-3 days post-operatively then slowly start to resolve over the next week to ten days. Along with the swelling, it is normal to experience limited opening and discomfort with chewing. A soft or liquid diet may be more comfortable during the first 5-10 days following the removal of wisdom teeth. If a patient has any questions or concerns about their post-operative course or prescription medications they should call our office so that we may address the concerns as soon as possible.